This holiday season, TIFF Cinematheque presents a retrospective devoted to Japan’s Studio Ghibli — one of the most influential film studios in the world. Following its spectacularly popular run in the spring of 2012, Spirited Away: The Films of Studio Ghibli returns from December 13 to January 3 to delight TIFF Bell Lightbox audiences with a near-exhaustive 18-film collection that includes a blend of new 35-mm and digital prints. The showcase pays homage to the studio’s legendary Japanese animation team led by Isao Takahata and Hayao Miyazaki, its trademark animation style, powerful storytelling, and deeply felt humanism. TIFF is honoured to finally feature the rarely-screened masterpiece Grave of the Fireflies, one of Ghibli's supreme accomplishments and regarded by many as the greatest animated film of all time. The lineup also includes From Up On Poppy Hill, a father-son collaboration between studio co-founder Miyazaki and his son Goro; beloved classics such as My Neighbor Totoro, Princess Mononoke and Kiki’s Delivery Service; rarely seen titles Only Yesterday and The Ocean Waves; and Hayao Miyazaki's Academy Award®-winning Spirited Away. Audiences will have the chance to experience many of the films in two versions: in their original language with English subtitles, and star-studded dubbed versions voiced by high-profile talent including Cate Blanchett, Dakota Fanning, Matt Damon, Tina Fey, Anna Paquin, Kirsten Dunst, Billy Bob Thornton, Minnie Driver, Amy Poehler, Claire Danes and Liam Neeson. To kick off the series, avid cinephile and celebrated director Guillermo del Toro leads a Master Class session on December 12 that will consider Miyazaki’s artistry with an extended introduction and post-screening discussion of Castle in the Sky. Tickets for screenings go on sale December 4 for TIFF Members, and December 11 for the public. The Master Class with Guillermo del Toro is currently sold out. A limited number of tickets will be available to the rush line 10 minutes before the start of the screening. Hayao Miyazaki’s dazzling action-adventure epic was the first film released under the Studio Ghibli banner, establishing the studio’s trademark art style, its tradition of strong female protagonists, and the political/ecological underpinnings of its intricate fantasies. The young heroine Sheeta possesses a powerful crystal that might hold the key to the discovery of Laputa, a legendary floating city concealed within a violent thundercloud. Escaping from the clutches of the sinister Colonel Muska, Sheeta joins forces with engineering apprentice Pazu and the two friends set out to find Laputa on their own, hotly pursued by Muska’s men and a band of sky pirates lusting after Laputa’s fabled treasure hoard. 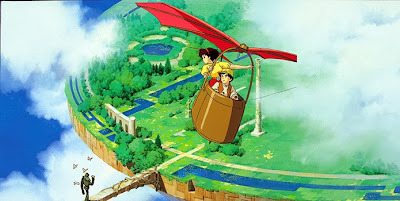 Released in an excellent English-dubbed version by Disney in 2003 (with the voice talents of Anna Paquin, James Van Der Beek, and Mark Hamill), Castle in the Sky is a luminous testament to the power of hand-drawn animation. Miyazaki’s most beloved film (and most beloved character), My Neighbor Totoro eschews the frenetic pacing, vulgarity and violence of so much children’s entertainment in favour of warmth, gentle humour and wide-eyed wonderment. When the Kusakabe family moves to a new home next door to a dark forest, sisters Satsuki and Mei discover that the house and the woods abound with spirits and strange creatures, most notably the massive but good-natured Totoro, who befriends the girls and takes them on a series of magical adventures. Along with the very different Akira, My Neighbor Totoro helped bring Japanese animation to global attention, with Totoro himself becoming a genuine folk hero; his grinning, balloon-like countenance adorns Studio Ghibli’s logo and its Tokyo headquarters. When Sophie, a teenage girl who works in her father’s hat shop, meets the charismatic wizard Howl, she inadvertently arouses the wrathful jealousy of the evil Witch of the Waste, who casts a spell that turns Sophie’s face and body into that of a 90-year-old woman. Seeking to dispel the curse, Sophie is led to Howl’s castle, a colossal, sentient flying machine, and embarks with the wizard on a series of magical adventures and into the crucible of a destructive war that Howl is desperately trying to stop. Adapting and considerably altering Diana Wynne Jones’ eponymous fantasy novel, Miyazaki creates one of his most visually inventive works, and introduces a deeply felt pacifist theme which he stated was inspired by his outrage over the American invasion of Iraq. 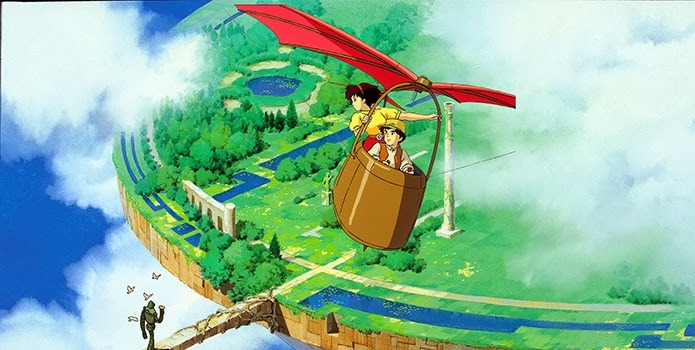 One of the most financially successful Japanese films of all time, Howl’s Moving Castle appeared on numerous critics’ 10-best lists upon its North American release, and received an Academy Award nomination for Best Animated Feature. A breathtakingly ambitious sci-fi/fantasy epic, Nausicaä of the Valley of the Wind brought a new artistic credibility to anime, and its success led to the founding of Studio Ghibli. Nausicaä is a warrior princess from the Valley of the Wind, the last bastion of civilization in a world whose ecosystem has been destroyed in the wake of an apocalyptic war. When an airship bearing one of the monstrous creatures used in the war crashes in the Valley, Nausicaä is forced to defend her homeland against two warring clans who seek to claim the living weapon for themselves, even as the giant insects that thrive in the vast toxic jungle threaten to wipe out an unworthy humanity once and for all. A visual marvel, featuring some of the greatest monsters in the Ghibli canon, Nausicaä established the ecological and political themes that would form the philosophical foundation of the great Ghibli films to come. Taeko Okajima, an office girl from Tokyo, decides to take a 10-day vacation in the country. Not having any close family to stay with, she chooses to visit some relatives of her sister’s husband and work on their safflower farm. The slow, laborious process of harvesting the crops gives Taeko an opportunity to reflect on her past, and what her life goals might be. With flashbacks to her school days, we follow Taeko’s thoughts as she becomes aware that her life, although steadily evolving, has for the most part been unfulfilling and aimless. Taeko finds a friend in Toshio, a second cousin who supports organic farming, and through their friendship she re-evaluates her life, realizing that with a little help from the past, she may yet be able to build a new future. Never released on home video in North America, Only Yesterday offers a study on the profound beauty of rural life, positioned alongside nostalgic and humorous recollections of 1960s Japan. After a mysterious encounter in the skies during World War I, famed flying ace Marco Rossolini was cursed to look like a pig. Now known as Porco Rosso, he works as a flying bounty hunter on the sun-kissed Adriatic Sea protecting ships from sky pirates, and repairing often to the Hotel Adriano and the company of his friend (and possible love interest) Gina. After a run-in with a band of pirates and their hired American gun Curtis, Porco has his plane repaired by Fio, the mechanically-gifted daughter of a long time friend, who soon becomes an unwitting pawn in the duel between Porco and Curtis, who has eyes for Gina himself. Placing Miyazaki’s trademark brand of whimsical fantasy within an unusually specific historical and political context — the post-WWI depression and the rise of Italian fascism — Porco Rosso is a high-flying adventure with a porcine twist, and was the highest-grossing film of its year in Japan. On the occasion of her 13th birthday, klutzy witch-in-training Kiki leaves her hometown in the company of her talking black cat Jiji, as it is customary for all witches to live alone for a year when they reach 13. Settling in a quaint seaside town, Kiki starts her own broom-borne courier business, but finds that her powers are fading in the face of her insecurity and self-doubt. Taking place in a gorgeously rendered, geography- and era-blurring alternate reality — Miyazaki himself provided many of the intricate hand-painted backdrops — Kiki’s Delivery Service is a sweet-natured and inspirational coming-of-age story, forgoing grand adventure for the discoveries and epiphanies of everyday life. Released in an English-dubbed version by Disney in 1998, with Kirsten Dunst as Kiki and the late Phil Hartman as Jiji, Kiki’s Delivery Service has proven to be one of the most popular Ghibli titles in North America. Rarely screened in Canada, Isao Takahata’s masterpiece was unavailable for TIFF’s previous Studio Ghibli retrospective; so it is a thrill to be able to present it for the series’ return engagement. In Kobe, Japan in 1945, teenager Seita has become accustomed to the presence of American bomber planes flying overhead, but on one fateful day he experiences their full, destructive power: after a firebomb raid on the city, his mother is horribly burned and his neighbourhood is set aflame, leaving him and his five-year-old sister Setsuko homeless. As the final, bloody days of the war rage around them, the two children must learn to survive with little shelter, less food, and even scarcer hope. A film of profound emotional resonance and the zenith of Ghibli’s humanist storytelling, Grave of the Fireflies is perhaps the most important film ever created at the studio — and as a decisive declaration of animation’s ability to tell any kind of story, even the most tragic and painful, it ranks as one of the greatest animated films of all time. Winner of the top prize at the Berlin Film Festival and the Academy Award for Best Animated Feature, Spirited Away is Studio Ghibli’s best-known and most critically-acclaimed work, and a modern classic of the animated film. After they move to a small suburban town, 10-year-old Chihiro and her parents discover what seems to be an abandoned amusement park which mysteriously contains a restaurant with plenty of food, but no customers. When her parents are turned into pigs after sampling the restaurant’s cuisine, Chihiro discovers that the park is a haven for hundreds of spirits and monsters ruled over by the bobble-headed witch Yubaba. In order to save her parents, Chihiro is forced to work odd jobs in the spirit world, where she finds herself in the midst of a feud between Yubaba and her gentle twin sister. Featuring some of Miyazaki’s most dazzlingly imaginative creations — most notably the alarmingly immense masked spirit called No Face — Spirited Away is a visual wonder and a uniquely philosophical take on the standard coming-of-age story. Tanuki, the legendary Japanese raccoon-dogs, are fun-loving creatures who live deep in the ancient forests. If you don’t see them, don’t be fooled: their enormous pouches endow them with the power to create fantastic illusions, allowing them to transform into just about anything — even humans — to play tricks on us. Threatened by the encroachment of suburban developments for decades, one group of tanuki finally resolve to wage war against the workers and machines by relearning the ways of their ancestors. Rigorously trained with the aid of three tribal elders from the distant island of Shikoku, the insurgent tanuki use their illusion magic to stage a series of spectacular interventions to stop the invading humans once and for all. Isao Takahata’s whirlwind adventure is one of Ghibli’s most pointed and powerful ecological allegories, boldly mixing its funny animal animation with striking moments of action and tragedy. After high-school student Haru rescues an elegant black cat from being hit by a speeding delivery truck, the awkward teenager finds her locker inundated with gift-wrapped mice and her desk inscribed with crayoned cat-hieroglyphs. It turns out that the feline in question was Lune, Prince of the Cat Kingdom, and following a visit from the ultimate aristocrat — the Cat King himself! — Haru is plunged into the cats’ underground realm, where she finds that the hardest part of growing up is staying yourself — quite literally, when her body starts to take on an unmistakably feline cast. Alice in Wonderland meets The Metamorphosis with the never-fails kawaii factor of cat-anthropomorphism in the debut feature by second-generation Ghibli animator Hiroyuki Morita, which carries over the popular character of The Baron (a debonair, top-hatted cat figurine come to life) from the studio’s 1995 film Whisper of the Heart. As she approaches the last summer of junior high, 14-year-old Shizuku determines to read as many books as possible in preparation for her future career as a writer. After meeting a boy named Seiji, whose taunts clearly indicate that he has a crush on her, Shizuku discovers an antique shop whose array of fantastical items inspires her to start writing a book starring the shop’s most intriguing artifact, a top-hatted cat figurine called The Baron. This sensitive teenage love story was the first and last film directed by Yoshifumi Kondō, Miyazaki’s anointed successor at Ghibli, who died suddenly in 1998. (Miyazaki wrote in his eulogy for his long-time friend and collaborator that “his drawings were shining with the real admiration towards youthful freedom”). Whisper of the Heart was the highest-grossing film of its year in Japan, and its gorgeously rendered fantasy sequences representing Shizuku’s tales of The Baron (directed by Miyazaki) proved so popular that Ghibli made a spin-off film starring the dapper feline, The Cat Returns. Sixteen years in the making, Princess Mononoke was Miyazaki’s most ambitious and expensive film to date, a sweeping, gorgeously detailed historical fantasy with a powerful ecological message. After killing a rampaging boar-demon that attacked his village, a brave young warrior named Ashitaka is stricken by a curse that vastly increases his strength but will eventually kill him. Travelling to the west in search of a cure, Ashitaka comes upon Iron Town, an industrial settlement whose workforces are clear-cutting the nearby forest. Soon embroiled in a war between Iron Town and the forest’s giant animal gods, who are led by a young human girl named San — nicknamed Princess Mononoke (“Monster”) by the townsfolk — Ashitaka must try and bring peace to this war-torn land. Packed with high adventure and featuring some of Miyazaki’s most remarkable creations, Princess Mononoke was the highest-grossing film of its year in Japan, and the subsequent 1999 North American release (featuring the voices of Billy Crudup, Claire Danes, Billy Bob Thornton and Minnie Driver) further heightened Ghibli’s international reputation. humanistic Ghibli classics as Only Yesterday. Arriving at his aunt’s country house to rest before undergoing a heart operation, young Sho makes a strange and unexpected new friend: Arrietty, a beautiful 14-year-old and four-inch-tall girl who lives with her equally miniscule family in the secret recesses of the house, “borrowing” the small amounts of food they need to survive. Living in mortal fear of the “giants” whose houses they covertly inhabit, the Borrowers have kept their existence a secret for eons; and despite the growing friendship between Sho and Arrietty, the girl’s father declares that the entire family must find a new home. Based on Mary Norton’s classic children’s book The Borrowers, The Secret World of Arrietty was yet another triumph for Studio Ghibli, becoming the highest-grossing film at the Japanese box office for 2010 and winning the best animated film prize at the Japanese Academy Awards. This English-language version, released in North America by Disney, features the voices of Saoirse Ronan as Arrietty, along with Will Arnett, Carol Burnett and Amy Poehler. Ponyo is a fish-girl who lives in an underwater castle with her father and several sisters. Wanting to see more of the world, she floats away on the back of a jellyfish and finds herself stranded on the shore of a small fishing village, where she is rescued by a five-year-old boy named Sōsuke. Falling in love with Sōsuke, Ponyo determines to transform herself into a human using her father’s magic — but the forces she unleashes throws the natural balance out of order, resulting in a massive storm and a life-or-death challenge for Sōsuke. Loosely based on Hans Christian Andersen’s The Little Mermaid and incorporating the customary Ghibli ecological message, Ponyo marked Miyazaki’s return to more lighthearted fare and a new level of craftsmanship: the intricate animation of the sea and waves (much of it drawn by the director himself) resulted in the production of 170,000 separate images, a record for a Miyazaki film. Rarely seen outside of Japan, The Ocean Waves is one of Ghibli’s most poignant and unsung masterpieces, capturing the joys and drama of adolescence and teenage alienation with subtle insight and affecting sensitivity. Kōchi is your average coastal town on the sleepy, idyllic island of Shikoku, and young Taku is definitely your average high school student. But soon his quiet life will be turned upside down with the arrival of Rikako, a beautiful transfer student recently arrived from Tokyo. Taku and his best friend Yutaka are drawn in by Rikako's complicated family life and mercurial temperament, but as rumours start to spread at school the trio finds their friendship tested by changing relationships and the onset of adulthood. The first Ghibli film to be directed by someone other than Miyazaki or Takahata, The Ocean Waves was a project initiated and controlled by the studio’s younger artists under the supervision of 34-year-old director Tomomi Mochizuki, melding the classic Ghibli style with a more consciously mature narrative that reflects the concerns of the studio’s new generational cohort. This rarely-seen gem is a considerable departure for Studio Ghibli in terms of both style and story: not only does this gently humorous domestic comedy eschew the wild flights of imagination of Miyazaki’s fantasies or the historical gravity of director Isao Takahata’s acclaimed Grave of the Fireflies, but its comic strip-style animation (distinctly different from the traditional Ghibli style) was also created entirely on computers, making it the first Ghibli film to be made without traditional hand-drawn animation. In a series of titled vignettes such as “A Family Crisis,” “Marriage Yamada-Style” and “Patriarchal Supremecy Restored,” Takahata takes us into the daily lives of the Yamada family, which includes father Takashi and mother Matsuko, four-year-old daughter Nonoko, annoying older brother (is there any other kind?) Noboru, wise Grandma Shige, and family dog Pochi. Interweaving the family’s everyday life lessons with whimsical fantasy sequences, My Neighbors the Yamadas is a delightfully offbeat example of Ghibli’s focus on the intricacies of human relationships and the intersections of past and present.